Check out these 10 cool technologies not yet available in the United States. The telephone, TV, light bulb, airplane, automobile, air conditioner, microwave oven and even that pull tab on soda and beer cans were created and developed in the United States. That's why it's somewhat disappointing when we see amazing products in the rest of the world that haven't made their way yet to America. After all, we shared what we made. So why aren't we getting some of the cool, unique and interesting things available elsewhere that we could be using to improve our personal lives and businesses? There are several reasons. Many companies would rather release their products in their own country and then expand to other corners of the globe. But because the profit margins in America are slimmer and the patent laws more complex, some companies decide not to release items here at all. Meanwhile, many companies--even from the United States--have been releasing their products to South Korea first. The South Korean government made a conscious decision to become the most wired nation on the planet and serves as an incubator where businesses can work out bugs before introducing a product to the rest of the world. Whatever the reason, check out our list of 10 hi-tech products that haven't yet made it to the United States--but hopefully will someday. What it does: This technology tracks the movement and location of cars, trucks and motorcycles in real time. Right about now, you're probably checking the date of this article to see if it was written in 1987, long before the GPS revolution. 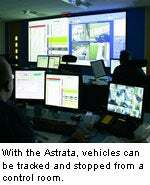 But what's so different about the Astrata is that people in the control room tracking the movements of these vehicles can literally stop them in their tracks--even if they're in a tunnel. If you're a truck driver, worried that the money, fuel or other precious goods you're carrying may be vehicle-jacked, fret no longer. The rest of us can just keep our fingers crossed. What it does: If you're an adult smoker, you can use the ID card as a debit card to pay for your cancer sticks electronically. But if you're underage--younger than 20 in Japan--it actually hampers your cigarette-purchasing efforts. By the end of 2008, more than 600,000 cigarette vending machines will be installed with an electronic age-verification device. If you're a concerned parent, or you want one of these machines in your stores, who do you beg to bring it over here? You might want to try the Japanese company, NTT Data, which worked with a group of companies to create the concept that allows transaction details to be transmitted wirelessly from the vending machine to a central system. What it does: You can hook these video glasses weighing less than 3 ounces into your iPod for a complete theater-like experience. Because you're looking at two screens, you get the sense that you're watching a 50-inch plasma screen. They come with stereo headphones and can run for more than six hours on one charge, so in one sitting you could watch about half of the Star Wars series. What it does: This security system debuted late last year at the AquaCity shopping mall in Tokyo. It's programmed to automatically patrol a set course through a mall. Alternatively, a security guard can control it remotely from afar. The robot knows how to enter an elevator and travel to the next floor. In fact, the robot knows quite a few things. If there's a fire, it can use a fire extinguisher; if customers want to know the time or the weather, the robot can tell them, as well as pitch sales going on in the store; if a lost child has been found, the robot can display that information on a screen located on its chest. It can even stand at an entranceway and check employee IDs. By the end of the year, the Reborg-Q should be at 10 locations around Japan. What it does: For the last decade or so, it's been a familiar drill. You go to some map software, print out a map with directions and take it with you in the car. It beats the old foldout road maps, so we don't complain. But you may start griping. BMW and Google Maps have aligned themselves to create Drive Assist. You look up an address at your personal computer using Google Maps and then e-mail the map to your car's GPS system. So there's no printing out a map and then typing in the address once you get in the car--at least not in Germany. What it does: Anyone who travels knows you can't take your bottled water on an airplane anymore. Authorities became understandably nervous there might be a clear chemical explosive in it after a terrorist plot hatched in England was foiled last summer. 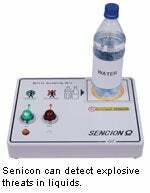 Senicon was developed to detect such liquid explosive threats. You set your bottle of cola or water on the device, and electromagnetic waves can instantly detect flammable or explosive liquids contained in glass or plastic bottles. The U.S. Department of Homeland Security is reviewing Senicon, but knowing the way bureaucracy works, it may be a while. What it does: It's one of life's little annoyances: You're traveling from one time zone to another, daylight-saving time kicks in, or your watch battery simply runs out. You struggle with the small knob to reset your watch, inevitably setting you back a minute or two, which you have to take into account. Maybe it's not the worst problem in the world, but if you're in Europe, you never have to worry about it again if you have the AW200 Braun. It's a regular two-handed watch, except that with the press of a button, a radio signal will reset your watch to Frankfurt, Germany time, which is standard European time. What it does: Ever wish you could use your cell phone like a wallet? We do practically everything else with it. Now, companies like China Mobile, Samsung, AT&T and MasterCard have been working together to come up with one global standard for all cell phones, so that we can stroll up to a wireless reader, wave our phone over it and automatically buy anything. It gives an entirely new meaning to the concept of the impulse buy. What it does: Even without the TV, it sounds great. The tub has air massage and water massage jets designed to soothe aching muscles, as well as a headrest, but what really makes it seem like the perfect American product is the 8.5-inch LCD screen with video input at the other end. You can watch a DVD, HBO or CNN while soaking in the tub. What it does: While America may not be clamoring for a shoeshine robot, you have to feel a little envious that South Korea has one. You stick your shoe in--one at a time, while it's still on your foot--into a machine that looks like a giant robotic shoe. In about two minutes, you'll have a cleaner shoe. It's perfect for politicians or anyone else who's constantly sticking their feet in their mouth. It's also ideal for anyone who wishes the 21st century looked a little more like what we were promised when we were watching The Jetsons. Wishing you could buy some of these products that aren't yet in America, but don't have the money for a plane ticket? There are at least two American companies that specialize in selling products you can't find in the United States. Check out www.dynamism.com and www.icube.us.